For questions or more information about any of our products and services, please email or call us at 877-843-0183. For solutions to all your convenience store design and walk in cooler requirements, we can help! JayComp is your convenience store design consultant. 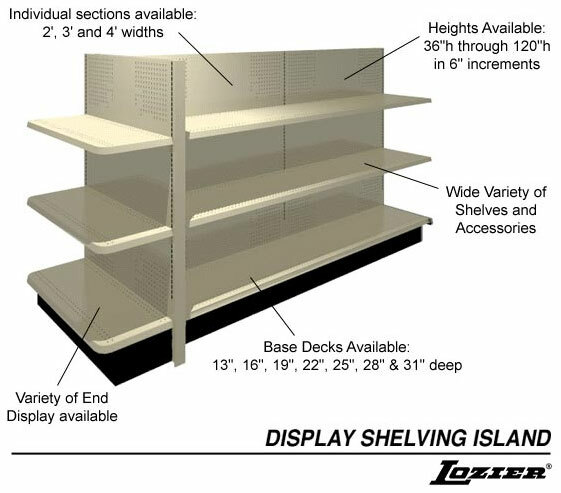 Lozier Gondola/Wall Shelving provides retailers with a number of options for customizing each store’s fixture layout. Whether you need Gondolas, Wall Shelving, End Caps, or Three-and Four-Way Merchandisers; Lozier manufactures components engineered of materials and finishes that complement varying retail styles. Meticulously engineered, Gondola/Wall Shelving features high tensile steel uprights that are slotted one inch on center for convenient shelf placement. Built-in levelers and snap-together parts make installation simple while yielding an exceptional load capacity. Lozier Gondola Shelving• The thousands of accessories available for Gondola/Wall Shelving address the particular needs of each store. All parts and accessories install easily. Lozier shelves are strong and versatile. Each shelf has slim, sturdy, multi-position steel brackets that allow the shelf to be used in multiple merchandising arrangements. The shelf diversity provides increased product visibility while reducing the wasted space caused by bulky brackets. A clean, attractive, colorful store has a strong influence on customer behavior and a powerful means of developing long-term business through repeat customers. With our Lozier shelves and other grocery and convenience store display shelves by top-name manufacturers, JaycompDevelopment.com has once again made it possible for business owners to create an environment that will keep customers happy and maximize profits. In addition to Lozier shelves, our company is pleased to offer products from SHOPCO USA INC. SHOPCO has extensive experience in store design has proven that certain design parameters have a major impact on sales and profitability. SHOPCO offers gondola shelving with end caps and rounded trim. Corner unit turns inside corners into attractive merchandising displays. SHOPCO’s optional base drawer baskets permit storage under the base of standard gondola and wall shelf units. Wasted space is turned into a useful storage area. SHOPCO’s all metal shelving units are designed with interlocking components that fit together without nuts or bolts. The standard in these shelves are available with either smooth, metal peg-board, or metal slat wall back panels. SHOPCO’s component system has standard curved pieces which can be assembled in various ways to take advantage of irregular shaped merchandising areas or catch the customer’s attention with creative displays.